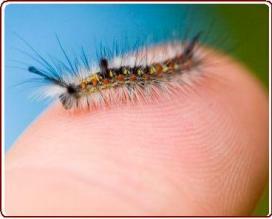 Teach your Children about nature and watch them thrive! 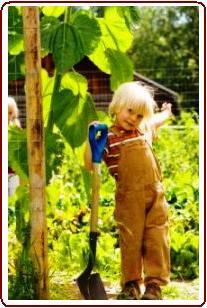 Observation and research has clearly shown that there are excellent educational spin-offs for children to be involved in gardening activities. Educational and developmental experts give precise or distinct ideas for activities that develop children's brains and minds at certain stages of their lives. Children growing up without full experiences of the ‘real deal’, such as watching insects on TV instead of investigating them physically, sadly have limited frames of reference. To over protect your child or limit their natural curiosity, is to deny him or her the ability later to make good decisions when faced with moving ahead in life, and dealing with practical and emotional issues. 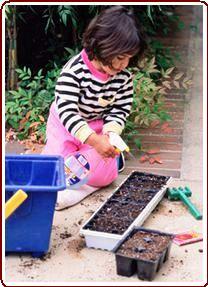 Certain gardening activities at certain ages provide some of the best learning platforms for this development. For example, young children up to the ages of 3 or so have to learn the very basics of the world they are in —in material form. But most important is how they can physically interact with it. This provides the basis for practical intelligence in the adult world. For example, the young executive with the innovative ideas goes nowhere without the practical reality. From ages 5-7, there’s a development of creativity — still in the material world. 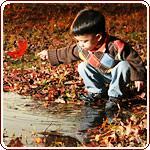 A more creative, imaginative play develops with a wider choice of natural materials. 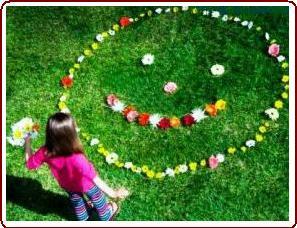 Children love to create something with the physical environment themselves, and also learn to share with others. This is where a child will make a house in the garden using a box, or makes a hill in a road with soil or a bridge with wood. 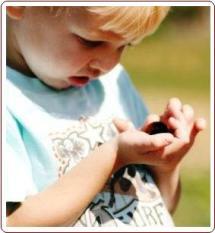 Where else can children explore or have such a range of experiences? Nature provides soil, sand, stone, shells, glass and leaves for moulding, building and digging. Using garden materials kids can explore the possibilities and gain the understanding of density, weight, malleability, porosity and suchlike. Jump forward to the ages of around 7 and 8, where the critical developmental time of growth happens. This encompasses the centres of the brain where the development of imaginative picturing and memory takes place. The physical material world is now known. At this stage, how a child puts it together in the greater picture, lays the foundation for further development of adult innovative and adaptive thinking ability. Children around this age are wondrous to watch. Give them the time, opportunity and encouragement to connect with their landscape... to further develop reverence for all growing things — the core of our identity. In other words to cement a mindset whereby they recognise how to live with the coming and going of the seasons and what nature provides us with. 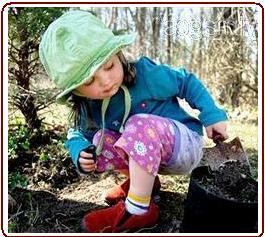 See a young child carefully making a tiny garden path lined with bits and pieces. Marvel at how that child describes the magic fairy corner (which are really sunflowers), overlooking the forest of leafy greens to be eaten by the giant fairies and gnomes that live in the big house nearby. The companions of happy marigolds, the straggly-haired borage, spiky garlic, surrounded by the fairy or elves ring of parsley and carrots. The creative shells, shiny bits and pieces, bits of brick, sticks can all be part of what that child can imagine them to be! What people, parents and educators don't realise is that the right activity matched to the 'learning readiness' or the correct stage of learning readiness, is a joy a see and captivates the child's attention wholeheartedly. The 1-2 year old playing with mud, sand or water is just as engrossing as say, the 9 yr old’s produce plot. Proudly feeling like a ‘little provider’ this child is at the age which is the time of developing the concept of farming — the idea of a self-sufficient fort or food farm. 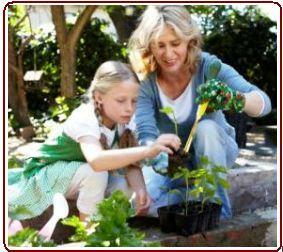 Here are the general stages children relate to learning about nature and the gardening activity steps. Caution: These are generalisations... your child is unique and will do what is right for him or her with your patience. Many little beings jump outside of these guidelines! Exploration of material aspects of the garden, soil, sand, water, wood. Plants can be pulled to bits! The different surfaces such as shiny, dense, fluid and malleable are good and necessary experiences at this age. They won’t appreciate your art work! Forget about constructing a sand castle and wanting them to admire it. They want to experience the texture and substance of it. The same materials as above but with a wider choice. Boxes, cardboard, stones, shells, etc. Hills made of soil or sand, roads from digging a trench. A pathway with planks. 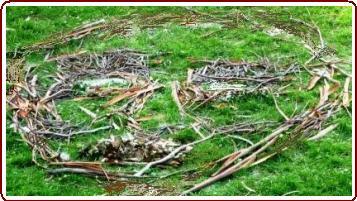 A house made of leaves and twigs. They start to get the appreciation of plants. They love feeding or watering plants. They enjoy being shown how to set up a building corner of the garden, combining natural and man made materials, like soil, leaves, old branches. Even plastic and pots and cups, provides a very good developmental experience. Girls more often like to create a place to have a tea party, create a shell garden or a fairy dell. Boys usually gravitate to digging, shoving soil around, making hills, tunnels and roads. 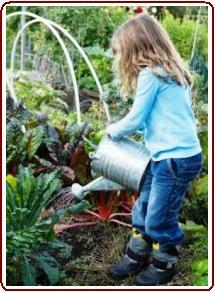 This is a good time to begin the simple (one or a few vegetables) garden... planting and nurturing its growth. This provides the basis of ecology and inter-connectiveness of life. Children adore watering now. Buy them their own sized watering can. They delight in watching their plants grow and picking then eating them. Give them quick growing or interesting plants to grow. Here again, more and a wider choice of activities and developing social content, eg: a place to invite friends into the garden. A place for a tea party, veggies to pick and eat. Building things with more details. Constructions of a themed garden, shell garden, building little fences and miniature ponds. Maybe a smell garden — which brings in the sensory aspect where they can smell all the smells, or companion planting — which shows how friends get on well together. Creative story telling, such as fairy tales, story themes, and myths and legends, all become of particular interest in children around 9 yrs and up. Hansel and Gretel for example, where they can read or listen to stories like these and make their interpretations and invent their own little tales of imagination. They like to make secret places, magic paths, tall trees surrounding a dell, a magical seat and special flowers, like sunflowers, daisies, and vegetables, like carrot tops being hair. They create stories around nature’s treasures. They make pathways with barriers of sticks and stones that can only open with passwords. This is getting to be a good time for looking and showing them the whole seasonal aspect of planting, moon influences, weather, soil, the idea of rotational planting, summer and winter. They may see the zucchini flower... the colour of the moon and call them moon plants. They may have a theme such as a secret garden, magic garden, or shoe garden like Cinderella’s slipper. They might like a small cave, and special plants that grow over it. They like creating structures that they decorate with nature’s materials. Now the farming concept is strong. Here’s where adults need to get more involved, as it’s a broader concept for these young minds... going through the whole cycle of the planting, growing and harvesting a little plot. 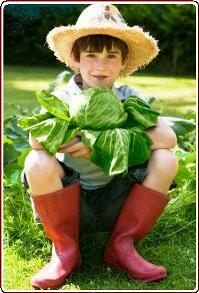 It’s perfect for each child to have their own particular plot and produce food. A bit of competition inspires them even amongst family members, but they do like to tend their own patch. Growing something for a market or stall is great. Rows, calculations of plants, spacing, area, height, timing etc bring in the maths concepts of division, multiplication and addition etc. The effort involved needs to be easy, simple but productive (the no-dig method is perfect)! The joy of presenting their home grown luscious vegetables or even beautiful flowers to their Grandma is rewarding and gives deep contentment to a child. They take great pride and love to be seen as a little provider of the bowl or salad or dish of green peas on the table. A small reward of money or something they appreciate goes down well. This is the beginning of the steps of community providing and connecting to and serving the earth and other people well.